The candidate favored by China's Communist leadership was chosen as Hong Kong's new leader on Sunday, in the first such vote since huge pro-democracy protests erupted over the semiautonomous Chinese city's election system in 2014. 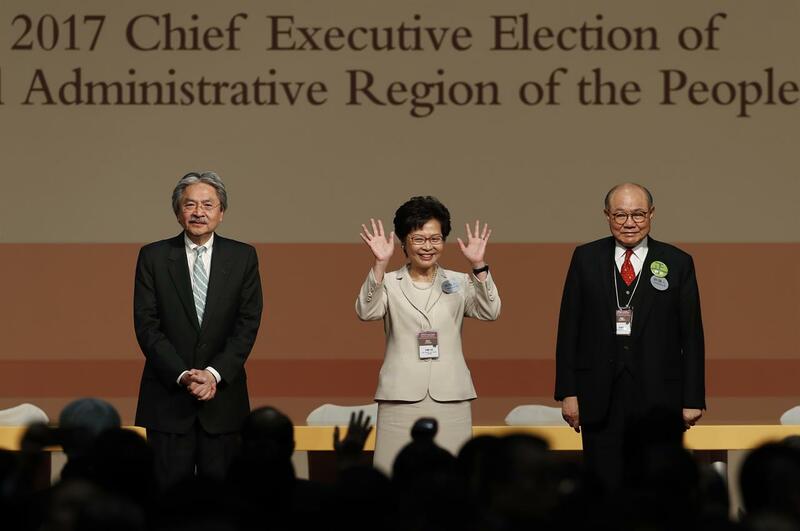 A committee dominated by pro-Beijing elites selected Carrie Lam, Hong Kong's former No. 2 official, as the financial hub's chief executive even though she was far less popular than her main rival. Lam received 67 percent of the votes cast by the 1,194-member committee. Her victory was hardly a surprise. 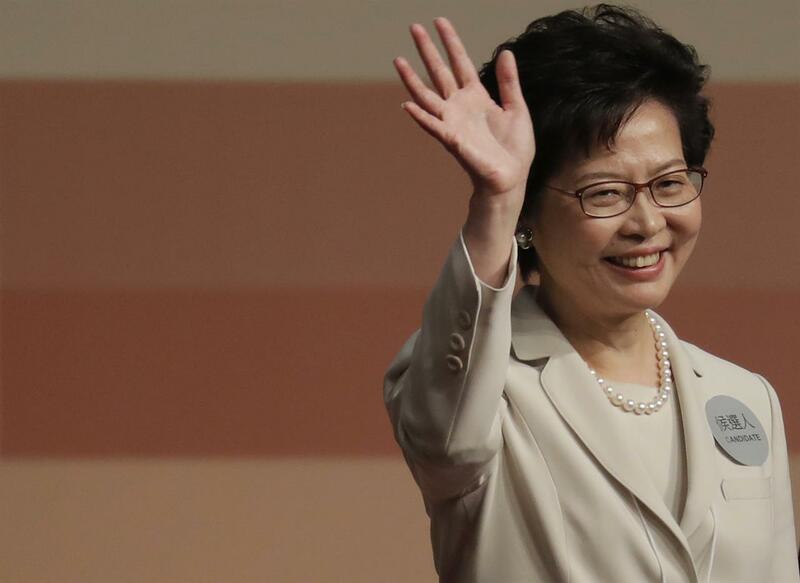 China's leaders had lobbied heavily behind the scenes for the 59-year-old Lam, who will become Hong Kong's first female leader and its fourth since British colonial control ended in 1997. 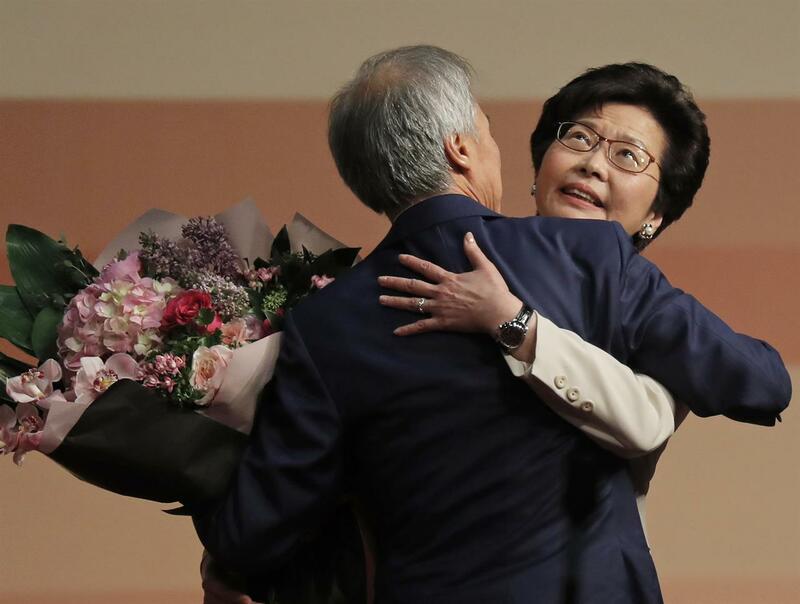 After the votes were counted, she bowed to the crowd and shook hands with the second-place finisher, former Finance Secretary John Tsang. 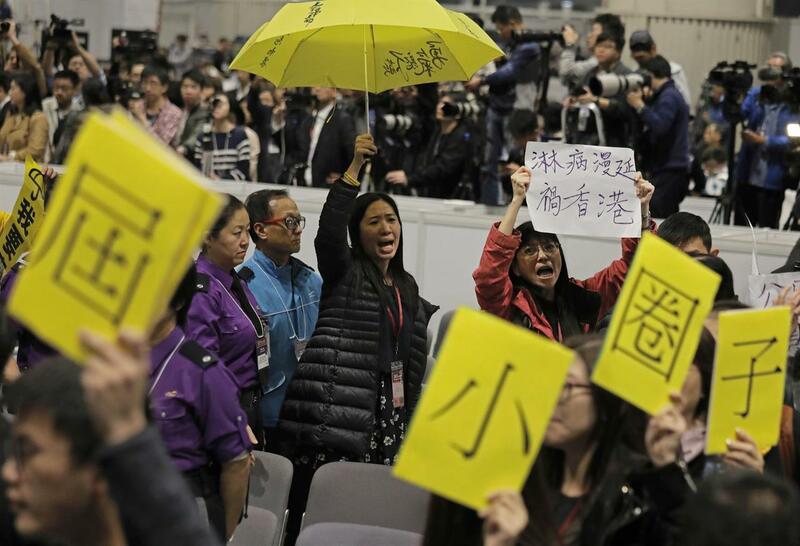 Some pro-democracy supporters in the official seating area yelled slogans and held up a yellow umbrella, the symbol of the 2014 protests, as the results were announced. 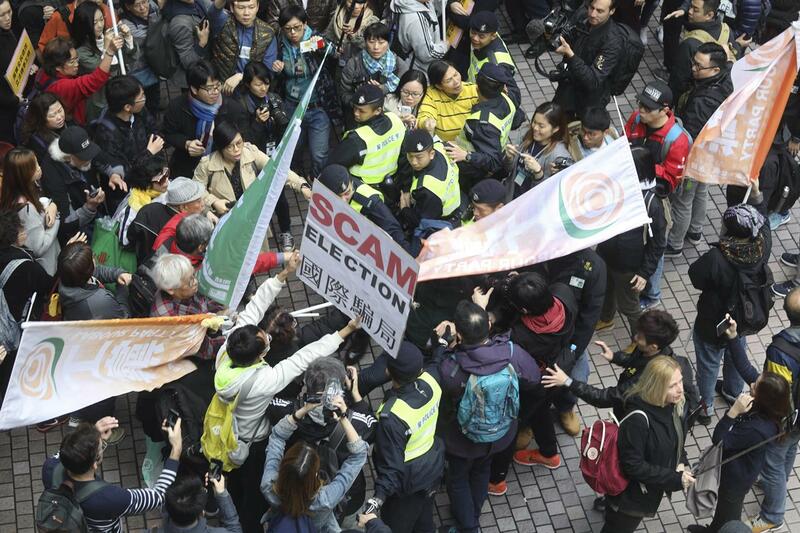 The elite election committee was at the root of the protests, with activists decrying the lack of a direct choice by Hong Kong's 3.8 million registered voters. 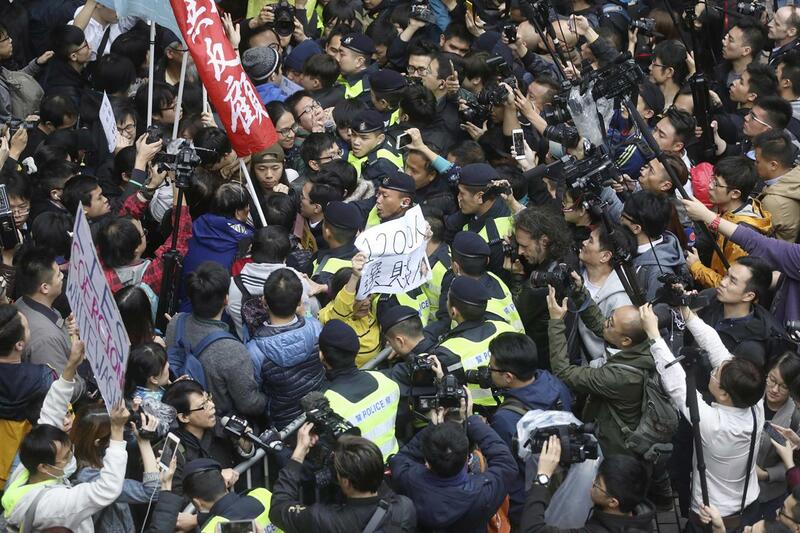 Democracy supporters called Sunday's vote a "fake election" and blasted Beijing for meddling in Hong Kong's affairs. Political party Demosisto, founded by the young pro-democracy protest leader Joshua Wong, said in a Facebook post that "this result is a nightmare to Hong Kongers." It said it would organize "a large civil disobedience protest" when Lam is sworn in on July 1. Lam, a lifelong civil servant, has a reputation as an efficient and pragmatic administrator, but is unpopular with Hong Kongers because she's seen as a proxy for Beijing and out of touch with ordinary people. Tsang, in contrast, is highly popular because of his easygoing persona and deft use of social media. He was nicknamed "Pringles" or "Uncle Chips" in Cantonese for his signature mustache that drew comparisons to the snack food mascot. Lam received 777 of the 1,163 validly cast votes. Tsang got 365 votes, or 31 percent, while the third candidate, retired judge Woo Kwok-hing, had 21 votes. As the next leader of the Asian financial center, Lam will inherit a city roiled by political divisions, including a burgeoning independence movement, and saddled with sluggish economic growth. Many fear that Beijing is tightening control and undermining the "one country, two systems" framework that guarantees Hong Kong a high degree of autonomy. Those fears have been amplified by several cases in recent years, including the secret detention on the mainland of five Hong Kong booksellers and a Chinese tycoon's suspected abduction in Hong Kong by mainland security agents. 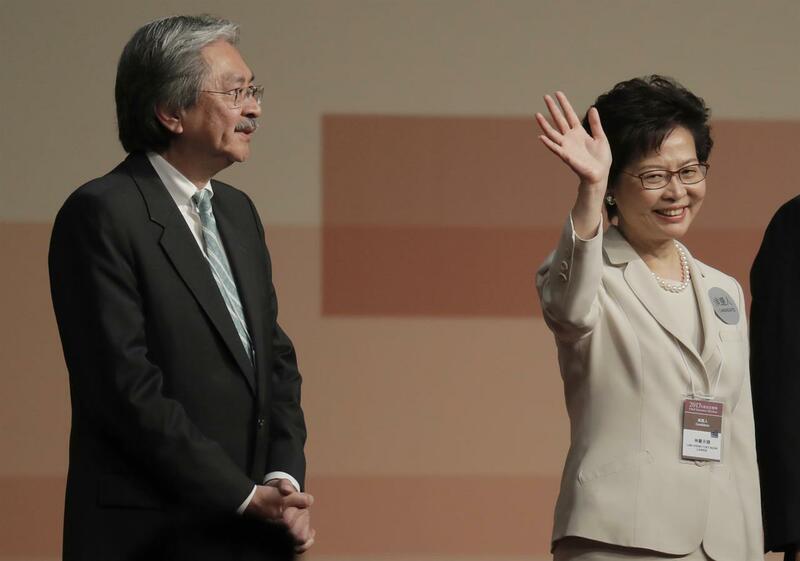 Lam's ability to soothe tensions relies on how much public support she can gain. She lagged far behind Tsang in opinion polls. "My priority will be to heal the divide and to ease the frustrations and to unite our society to move forward," she said at a news conference after the results were announced. Lam said she would not immediately revive attempts to revamp the electoral system, a potential political flashpoint that could rekindle protests by pro-democracy supporters. She said she wanted to focus on other more pressing issues such as housing, education and health care. "There is a serious divide in Hong Kong, so why don't we start with the easier subjects and try to reach consensus" on how to tackle them, she said. Lam succeeds current leader Leung Chun-ying, who cited family reasons when he ruled out a second term. 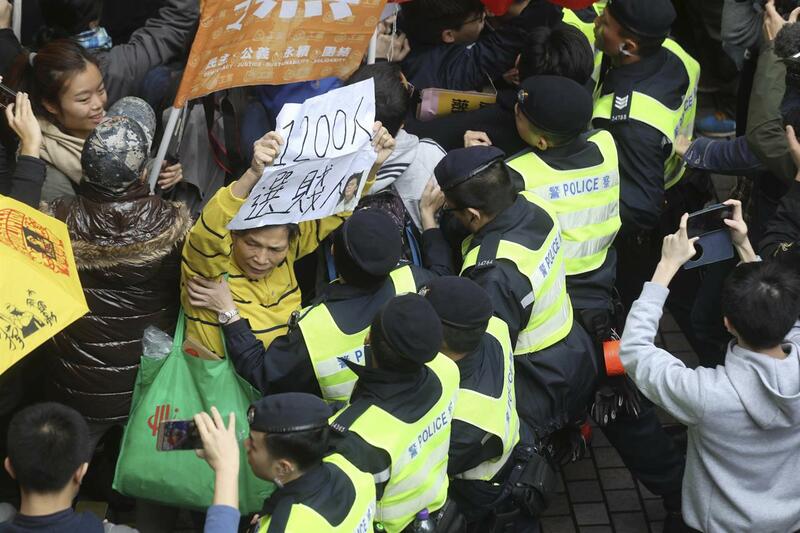 Political analysts suspect Beijing asked Leung, a highly polarizing figure, to step aside. The Hong Kong and Macao Affairs Office of the State Council, China's Cabinet, said in a statement that Lam met the standards to be the city's leader, including "being trusted by the central government," a key factor that Tsang's opponents repeatedly said he did not enjoy. When reporters asked Tsang on Sunday whether he thought Beijing had interfered in the selection process, he said he respected the decision of the election committee members. "I mean, all they have is themselves and their conscience when they voted. So it's their responsibility, nobody else's," Tsang said. Members of the Hong Kong election committee include tycoons like Li Ka-shing, Hong Kong's richest person. They represent industry and trade groups such as finance, accounting, real estate and textiles. The way the members are chosen also irks democracy activists. Some are elected by peers, but others are uncontested, especially in sectors most supportive of China's Communist leaders. Hong Kong lawmakers, local councilors and delegates to China's rubber-stamp parliament also have votes, and some 326 seats, mostly in the education, legal, health and social welfare sectors, are held by pro-democracy supporters. Protesters raise an yellow umbrella and placards to protest against former Hong Kong Chief Secretary Carrie Lam after she declared her victory in the chief executive election of Hong Kong in Hong Kong, Sunday, March 26, 2017. A committee dominated by pro-Beijing elites chose Hong Kong's next leader Sunday in the first vote since huge pro-democracy protests erupted over the election system in 2014. Lam, the government's former No. 2 official and Beijing's favored candidate, received 777 votes and will become the first female leader for the city and its fourth since British colonial control ended in 1997. 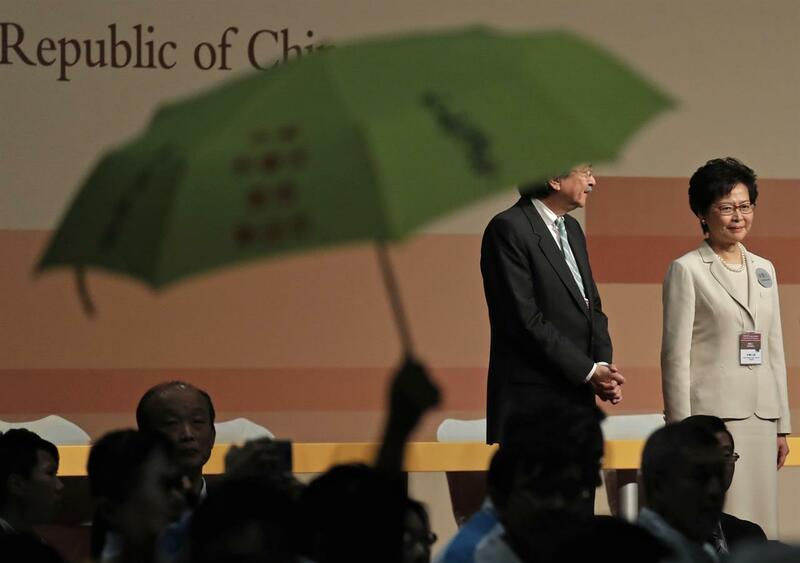 A protester raises an umbrella to protest former Hong Kong Chief Secretary Carrie Lam, right, after she declared her victory in the chief executive election of Hong Kong while standing with former Financial Secretary John Tsang in Hong Kong, Sunday, March 26, 2017. A Hong Kong committee has chosen the government's former No. 2 official Lam to be the semiautonomous Chinese city's next leader. Protesters scuffle with police officers during a protest against the chief executive election in Hong Kong, Sunday, March 26, 2017. A committee dominated by pro-Beijing elites is casting ballots Sunday to choose Hong Kong's next leader in the first such vote since 2014's huge pro-democracy protests. The system has been criticized by pro-democracy activists as a "fake election". 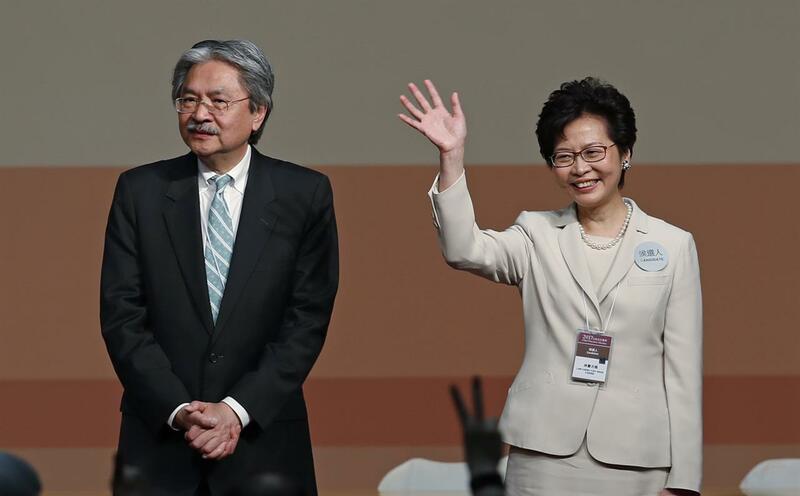 Former Hong Kong Chief Secretary Carrie Lam, right, declares her victory in the chief executive election of Hong Kong next to former Financial Secretary John Tsang in Hong Kong, Sunday, March 26, 2017. A Hong Kong committee has chosen the government's former No. 2 official Lam to be the semiautonomous Chinese city's next leader. This combination of three file photos taken March 14, 2017 shows Hong Kong chief executive candidates, from left, former judge Woo Kwok-hing, former Financial Secretary John Tsang and former Chief Secretary Carrie Lam, speaking during a chief executive election debate in Hong Kong. Hong Kong’s next leader will be chosen Sunday, March 26, 2017 by an election committee stacked with pro-Beijing elites who heed the wishes of China’s communist leaders rather than the semiautonomous region’s voters. A closer look at each potential replacement to unpopular incumbent Leung Chun-ying, whose term ends in June.